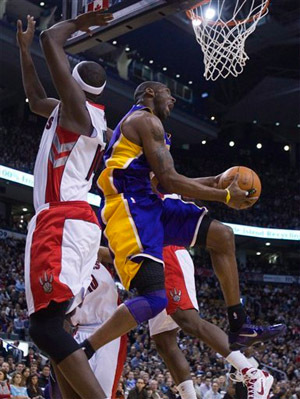 Kobe Bryant reverses home two against Raptors. Paul Gasol reverses it home for two against Blazers. There is little doubt who the MVP of the Lakers has been the first two weeks of the season. Pau Gasol continues to dominate all opponents, notching his fourth career triple-double, as the Lakers blasted the Portland Trail Blazers 121-96 at Staples Center on Sunday night. Gasol scored 20 points, grabbed 14 rebounds, and had 10 assists as the defending NBA champions stayed undefeated and moved to 7-0 on the season. For the big Spaniard, it was his first triple-double since February 17, 2009 against the Atlanta Hawks. It was also the Lakers’ second triple-double in three games, as Kobe Bryant got his 17th last Tuesday in Sacramento. 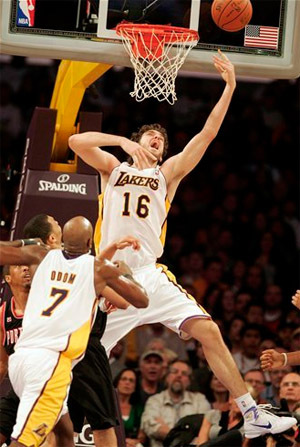 Lamar Odom also kept his All-Star-caliber play going, with 21 points and 12 rebounds, hitting 10-15 from the field. Kobe Bryant had another extended night of rest, playing less than 25 minutes and scoring just 12 points. Bryant wasn’t needed on this night, as the Lakers took control of the game from the opening tip, led by 13 after one quarter, and opened it up to 58-36 at halftime. The Blazers never got back into the game in the second half and shot just 42.7% from the field, to the Lakers’ season-high 54.9%. The game was quite a switch from Friday night, when the Lakers struggled to put away the lowly Toronto Raptors, and expected an even tougher effort from a quality Portland team that always gives them a bad time. The Lakers spread the offense around on this night, with seven players in double-figures. Shannon Brown hit 3-6 from beyond the arc en route to 15 points off the bench. Matt Barnes had 13 points and six rebounds off the bench, Derek Fisher scored 12, and Ron Artest had 11, also shutting down Blazer star Brandon Roy in the process. Roy was hounded by Artest all night, scoring just eight points on 1-6 from the field. His only field goal came midway through the third quarter. Andre Miller led the visitors with 20 points, Nicolas Batum had 17, and Rudy Fernandez put in 13 off the bench. The Lakers next play host to the struggling Minnesota Timberwolves on Tuesday. They can match the second-best start in franchise history at 8-0 with a win in that game. Phil Jackson’s best start as a coach is 12-0, when his Chicago Bulls accomplished the feat in the 1996-97 season. That team went on to a 69-13 record and an NBA Championship.